More than 200 migrants are missing in the Mediterranean Sea after a boat trying to reach Europe broke down, Tunisia’s Tap state news agency says. The Tunisian coast guard and army rescued 570 but up to 270 went missing in the stampede to get off the fishing vessel, the report says. An operation to rescue the would-be migrants began off the Tunisian Kerkennah islands on Wednesday. 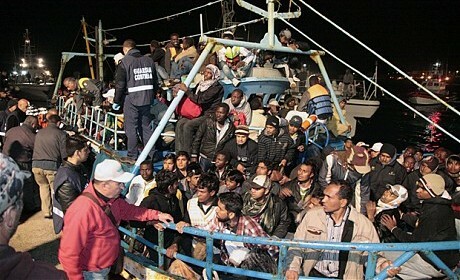 The mainly African migrants were on a boat bound for Italy from Libya. Search operations were continuing, a Tunisian security official told Reuters news agency. Tap said two people were confirmed dead during the rescue. Seven were injured and taken to hospital in the port of Sfax, while two pregnant women were taken to the maternity unit. On Wednesday night, 193 survivors were transferred to the Shusha camp near the Libya-Tunisia border, Tap said. It said another 385 would be sent to the same camp on Thursday morning. Italy has faced a massive influx of refugees since the fall of the regime of Zine al-Abidine Ben Ali in Tunisia in January and the outbreak of war in neighbouring Libya. The Italian island of Lampedusa lies only about 130km (80 miles) off the Tunisian coast. Italy has complained it is not getting enough help from its EU partners to deal with the influx, which has prompted some European countries to warn they may reimpose border controls.